In order to be sure that your shotgun will work properly under any circumstances, you need to work on it by cleaning it regularly. Regular maintenance is very important for keeping your firearm clean and functional, as well as long-lasting. 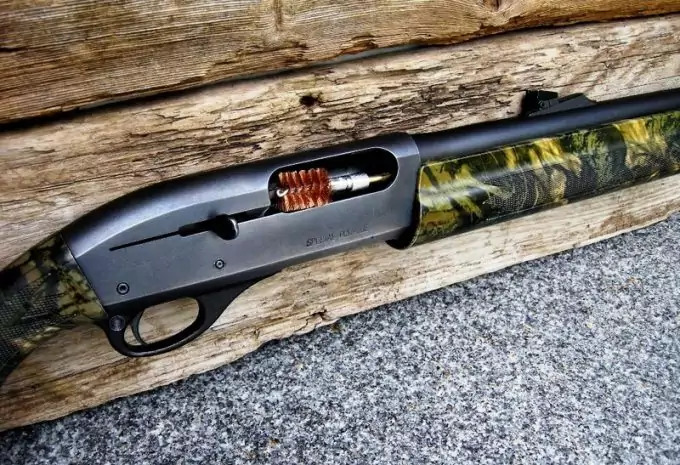 Maintenance is also about making your shotgun safe as you don’t want it to be unpredictable – you want it steady and reliable even when you are facing the worst SHTF scenario. You don’t want your shotgun to fail you when you most need it to work, so in order to help you get it all set up and ready, we have made a simple tutorial on how to clean your shotgun and make it last longer and stay as functional and reliable as on the day you have bought it. 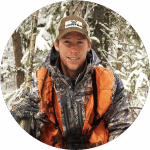 Safety first, of course – that is why we are starting off with teaching you how to safely unload your shotgun without getting hurt and avoid any possible accident. The first step is to unload the shotgun and you will do it by keeping your finger off the trigger. Point your shotgun in a safe direction, which is away from your body or away from anyone near you or around you. Then you will need to press the bolt action on your shotgun – you will easily find it as it is usually placed near the trigger guard. While holding the muzzle pointed in a safe direction, you need to unload your shotgun by pumping (using the pump action). Continue with pumping until all the shells appear in the tube or in the magazine compartment. Remove the ammo and make sure you have removed all the shells from the magazine/tube – this is extremely important as you don’t want any unexpected firing as you are cleaning your gun. That is why we said that safety always comes first. Get the bolt action button back at its place to check if there’s more ammo inside of the gun. 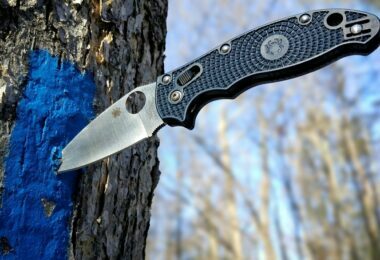 You will need some cleaning sheet or a cloth for this step as you will need to wipe all the build-up dirt and caked carbon created from long time usage – that is why you need to maintain your gun – you don’t want it corroded and dysfunctional. You will also find traces of old oil and powder, so you need to wipe all parts very carefully. All the gaps also need to be nicely wiped. 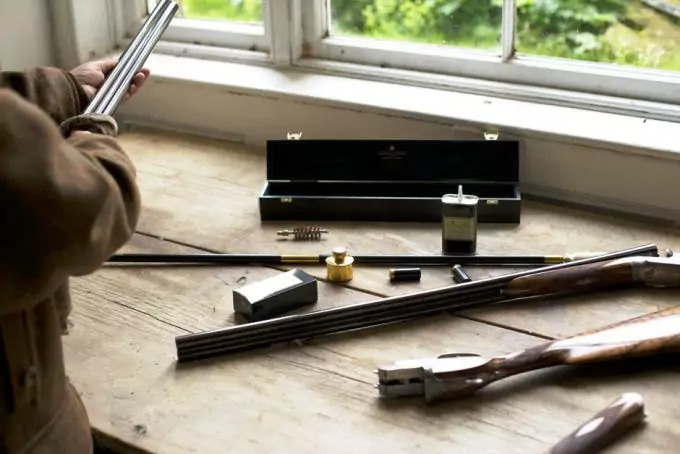 AS well as wiping the shotgun from the outside to make it clean and shiny, making it appear as brand new, you need to clean the area around the chamber. Some parts of the shotgun will make your cloth black – that means that you need to dedicate more time for cleaning those parts of the shotgun. In order to clean a shotgun, you also need to buy a solvent – there are a lot of cost-effective and quality solvent products available on the market. 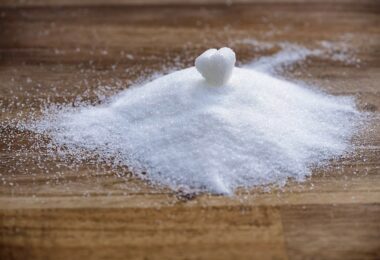 The best is to pick one that will not harm your health as you will be in contact with the solvent (your skin will and you will be continuously breathing it in as you are cleaning). You need to spray it generously. Trust me a lot of solvent is better than not having enough solvent sprayed on your shotgun! Let the solvent rest for 15 minutes or more so all the built-up dirt could get fairly soaked in it. Make sure all the areas are well covered – especially those with more dirt and caked oil, carbon and gun powder on. Once the 15 minutes had passed, you need to start with scrubbing. For this part of the cleaning, you will need to use a brush. 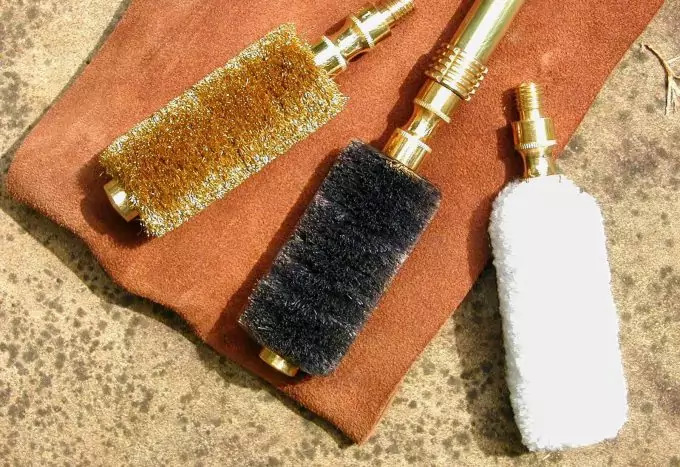 Brushes can be purchased – you can find high-quality brushes made of bronze and other materials specially made and designed for cleaning guns and scrubbing. Such a brush will help you remove all the dirt from shotguns, guns, pistols, etc. In the case you can’t or didn’t buy one of these special brushes, you can always find a great use in a regular toothbrush or any other similar brush. You will use the brush you have for cleaning your shotgun by thoroughly scrubbing its surface. By scrubbing the surface, the positive effects of the solvent will kick in and the build-up dirt will become easier to get cleaned and removed from the shotgun. The brush will make all seemingly unavailable parts of the shotgun a lot easier to clean, like nooks. Make sure you get a cloth that is completely lint-free for a more effective and neat cleaning. After the brushing and scrubbing the shotgun is over, you will use that lint-free piece of cloth to clean the whole surface of the shotgun, making it completely clean and dirt-free. Also the solvent layer will be removed along the way. Again, the parts that make your cleaning cloth darker or black, should be cleaned more than once and until completely clean. Instead of using cloths, you can use patches. You can buy special patches made and designed for firearm cleaning. These patches should be made of 100% cotton and are not reusable – luckily, you can buy them in batches of 50, 100 and even few hundreds of patches to backup your patch stash and have enough patches for cleaning when you need it. Now you need to take the solvent again and soak the gun in solvent. You will use the cloth all soaked in order to clean all the gaps and areas that are a bit more difficult to reach. Once more, just to make sure to remember that you need to clean all the areas thoroughly, especially the ones leaving black wipe-offs on your cloth. You will need a pick for this part of the shotgun cleaning. Take a pick and clean all the areas that are thought and presumed to have carbon build-ups. Carbon build-up can often be found in the chamber and in order to clean the chamber effectively, you need to use a pick to clean the sides and corners of the metal – that way you will be able to clean it thoroughly. 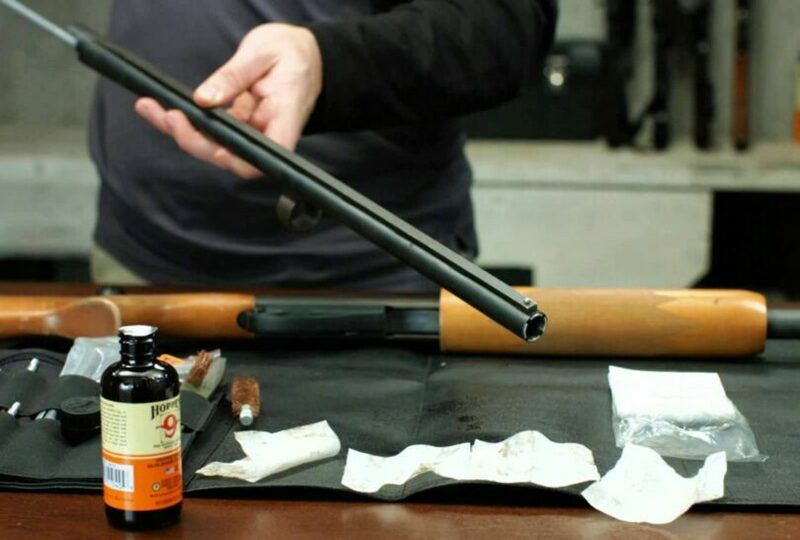 To have your shotgun completely ready and clean, you will also need to clean the barrel of the shotgun. You will use a clean cloth all soaked in solvent to swab the barrel. Instead of using a cloth soaked in solvent, you can use the cleaning rod to clean the barrel – this method, though, is not that precise, so if you want a top notch cleaning method, you’d better choose the solvent-soaked cloth. If you decide to go for the cloth cleaning, you will need to be changing cloths until you have completely cleaned the barrel. All the cloths will have to be soaked in solvent and once you are done with cleaning, you will use a dry cloth to swab the rest of the dirt from the barrel. Once you are done, oil another cloth up and swab the entire barrel. This will help you protect the barrel from oxidation, so there won’t be any rust appearing on the barrel of your shotgun. Step #9: Oil it up! Some parts of the shotgun need more oil than other parts – in the manual that came with your shotgun, there should be specified areas listed so you would know which parts should be oiled and how often you should oil them up. Check out our review of the best gun oil to use for more information. If there is no manual to help you with finding out which parts you need to look after when it comes to using oil to preserve your gun, then you can crack that out by yourself by simply looking over the parts that are most likely to get worn out. To point you towards the right direction we recommend you oil the bolt and the bolt rails to prevent oxidation and wearing off. The area you shouldn’t be oiling up is the housing and the firing pin. 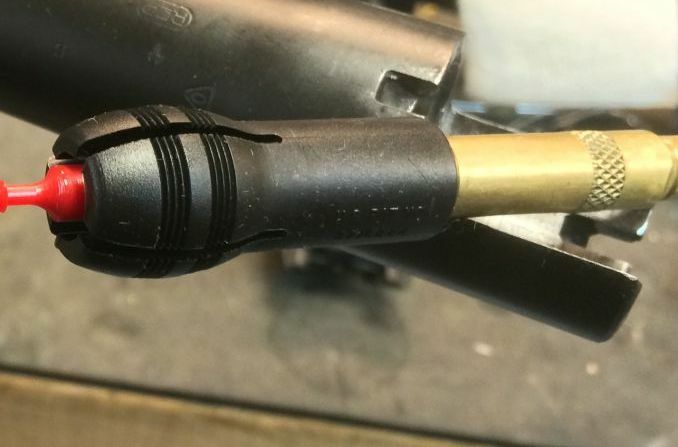 This is the case for the oil will help the dirt build up and then your shotgun will not be able to fire when you need it to – that is how you get a dysfunctional firearm. 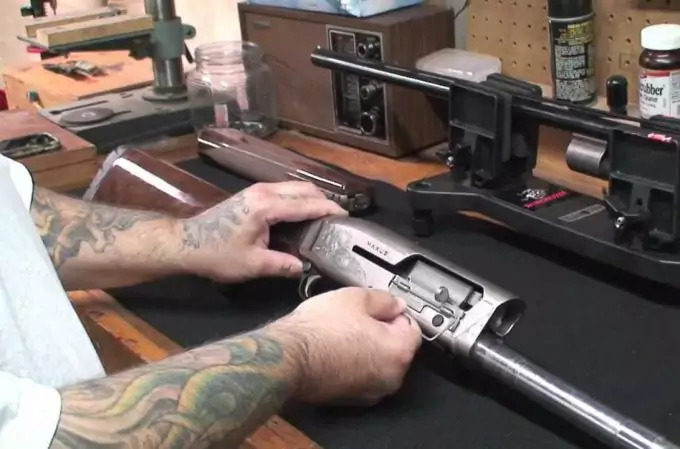 Once you are done with oiling the shotgun parts requiring oil for maintenance, you will need to use a clean cloth to wipe the shotgun and remove any leftover oil from the surface of the gun. What would also be useful to know is what you need to have around your house, so you would be able to clean your shotgun effectively. That is why we have compiled a list of all things necessary for shotgun maintenance. 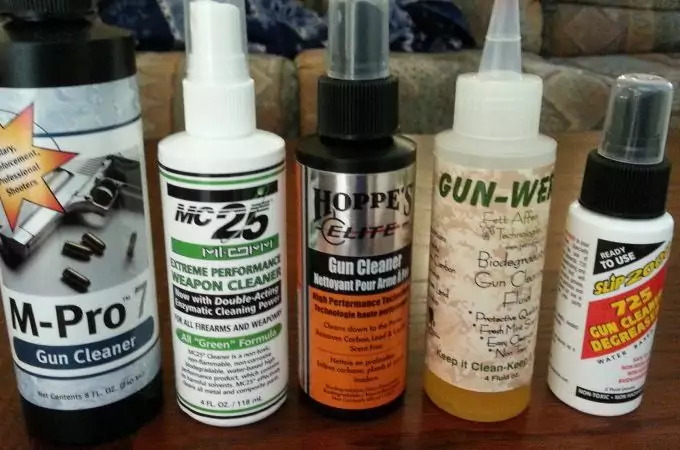 You can choose what you need from the list based on your personal preferences, but for most effective shotgun cleaning, we recommend you consider buying complete firearm cleaning kits where you will find everything you need for top-notch shotgun maintenance. 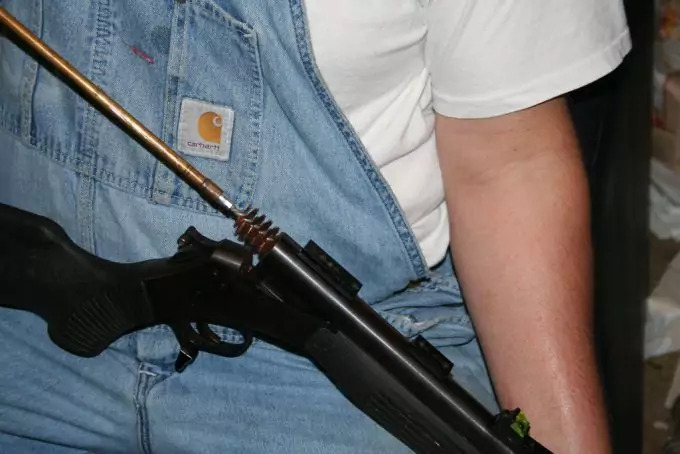 The cleaning rod is meant for helping you clean the barrel of the shotgun. And although many people use it for cleaning, we would rather suggest cleaning your barrel as described in our tutorial. In case you are still interested in using a cleaning rod for cleaning your barrel, then you definitely want to consider using a cleaning rod made of soft material, or at least constructed of any material that is softer than the material the barrel is made of. If you damage the barrel of a firearm, you get a dysfunctional firearm – that is why you need to be careful with your choice when buying gun cleaning gear. It is recommended to have picks among your cleaning gear as well. In our step-by-step guide, you will notice that there are some parts of the shotgun that are easier to clean with a pick. You can clean the chamber and pieces of metal more effectively with using a pick and remove all the carbon build-up. Jags and loops are a sort of attachments that are meant to be used along with the cleaning rod. Both, jags and loops are used by being placed on the tip of the cleaning rod. You use it to clean the barrel of the gun. The middle of the jag is attached to the point of the cleaning rod which keeps it safe and secure from being moved as you are pushing through the bore as you are cleaning your gun. 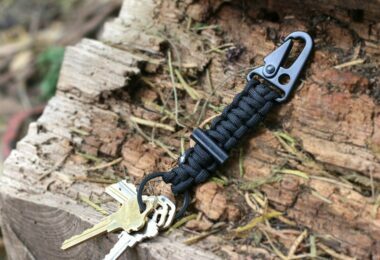 Loops are a bit different than jags, and as you can probably presume judging by the name of it, loops are hole-like attachments that you can secure to the cleaning rode (it looks like the end of a needle). You can use these attachments for more effective cleaning. You can always use a lint-free cloth for cleaning and wiping your gun, but what you can also use are patches specially sold as patches for firearm cleaning. Using a clean cloth for cleaning all parts of the shotgun is more than just fine, but in order to clean the bore with a cleaning rod, we recommend you use 100% cotton patches that are available to be purchased in big packages at fair and low prices. When cleaning the bore, make sure that you change the patch as soon as it gets dirty. 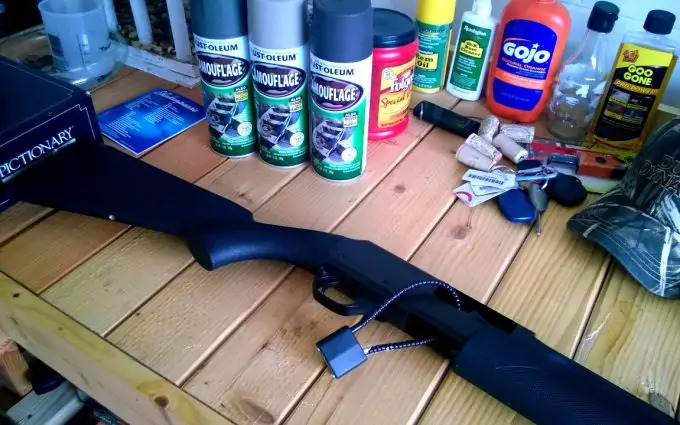 It is very important to use clean patches if you want to have your shotgun thoroughly cleaned. There is also an option for you to use swabs. Swabs are also great for cleaning shotguns and other firearm. To make your cleaning cost-effective, you can buy reusable swabs that can be used all over again once they are washed with warm water. For removing build-up carbon and dirt, you need to use a brush after you have applied the solvent as per our cleaning guide. However, you can clean the barrel with using brushes as well. Special gun cleaning brushes are usually made of brass, nylon or bronze. For more demanding dirt on the surface of the gun, we recommend brushes made of bronze as you will need something strong enough to help you remove all the build-up dirt and carbon. If you are using a brush on your barrel, we recommend the one made of softer material. We recommend a brush made of nylon so you wouldn’t damage the barrel of the shotgun. The solvent will help you dissolve and remove the build-up dirt, lead and carbon. It is highly recommended to buy a suitable solvent for cleaning your shotgun. You can choose the one that is environment-friendly and that will not harm you or your surroundings. If your shotgun looks a bit oily (and the fact is that no shotgun should look oily), that is probably because of the dirt that had built up on the surface of your gun. For effective degreasing, you can purchase one of the many degreasers available on the market. In order to protect your gun surface from oxidation you can use oils and gun lubricants. That way you will create a protective layer that will keep your shotgun protected from rusting. There are many different products available for protecting your gun if your shotgun is often exposed to heavy raining or bad weather. This will keep it safe from corrosion and make the gun last longer as a functional and corrosion-free firearm. For all the nooks that are pretty difficult to clean with patches or cloths, you can use an old toothbrush for effective full cleanse. If you want to step up your game when it comes to gun maintenance, you can buy a toothbrush specially designed for cleaning less reachable areas and remove all the build-up dirt effectively and without too much effort. Regular used toothbrushes can be a fairly good choice, but the materials used for making special gun cleaning toothbrushes are more suitable for gun cleaning demands and necessities and as such will probably add to the more efficient shotgun cleaning. 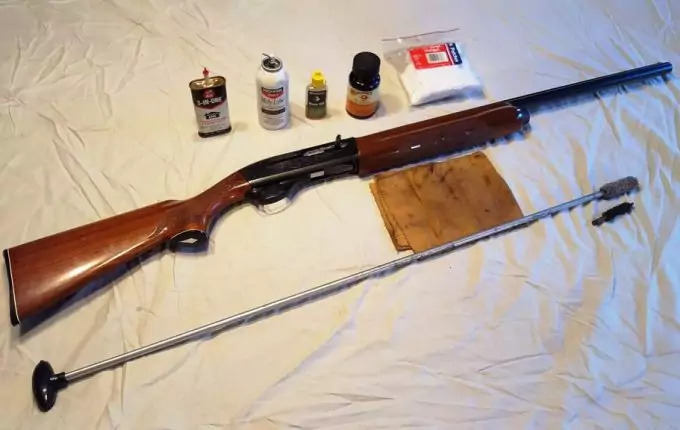 All in all, cleaning a shotgun is fairly easy and simple if you know which part of the gun requires which piece of your shotgun cleaning gear. For more effective shotgun cleaning you can buy an entire gun cleaning kit to match your cleaning preferences, but you can also follow up with our shotgun cleaning guide and list of all the gear items needed for maintaining and preserving functionality of your shotgun and buy all items you need separately, again by following your own personal preferences. 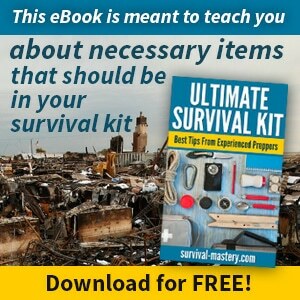 To remind you once again (but as a true survivalist you are most definitely familiar with that fact already) in order to have your shotgun ready when you most need it and know it will not fail you even in the most demanding SHTF scenarios, you need to work on maintaining it by performing regular cleaning and check-ups. A clean shotgun is a functional and the only type of shotgun you need! Check out our review of the best shotguns for home defense to give you more stellar choices.